Steven (Chicagoland, United States) on 24 November 2014 in Architecture and Portfolio. 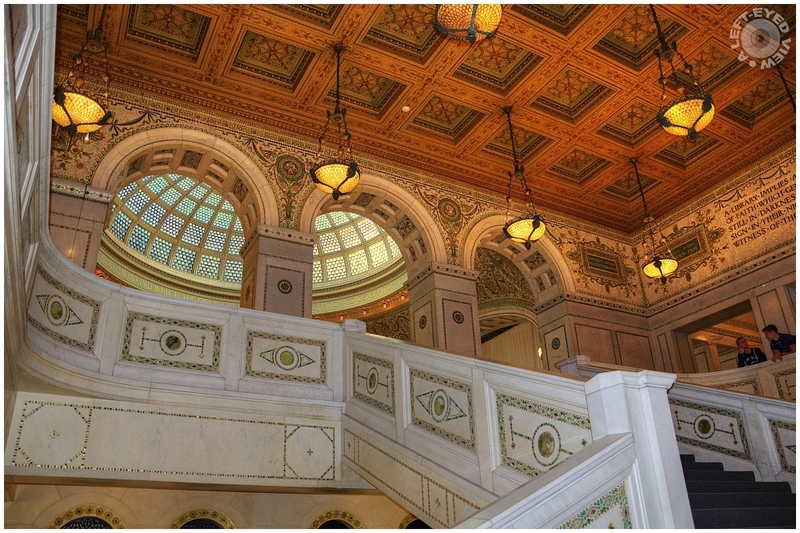 View up the main staircase of the Chicago Cultural Center toward the Preston Bradley Hall which contains the largest known Tiffany stained glass dome. Completed in 1897 as Chicago’s first central public library, the building was designed to impress and to prove that Chicago had grown into a sophisticated metropolis. The country’s top architects and craftsmen used the most sumptuous materials, such as rare imported marbles, polished brass, fine hardwoods, and mosaics of Favrile glass, mother-of-pearl and colored stone, to create an architectural showplace. Located on the south side of the building, the world’s largest stained glass Tiffany dome ― 38 feet in diameter with some 30,000 pieces of glass ― was restored to its original splendor in 2008. What a wonderful sense of space this carries . .
Good capture of this beautiful interior architecture. the perfec environment for a noble undertaking! A grand image of this beautiful building that's being put to good use. There are so many wonderful details here. Perfect interior exposure. Wonderful level of details and light. wow ! what a wonderful design ! Stunning image of this magnificent place ... the architectural details are spectacular !!! A spectacular building. The architecture and attention to detail is stunning! I would love to visit there! It is so beautiful. That must be your favourite place in the world. @Michael Rawluk: Could you tell by how many times it was tagged? :-) It would definitely be a great photo shoot for anyone. Quel intérieur avec des coupole ce plafond en carré le contraste la fine architecture superbe plafond et vue. Beautiful, Steven and my first thought was of looking up at the lights at Ellis Island. @Judy aka L@dybug: I can see why you were reminded!